As the deep freeze sets in overs the waters of Wisconsin, a group of wood-workers gathers in an old industrial building to prepare for much warmer days. GREEN BAY, Wis. — As the deep freeze sets in overs the waters of Wisconsin, a group of wood-workers gathers in an old industrial building to prepare for much warmer days. 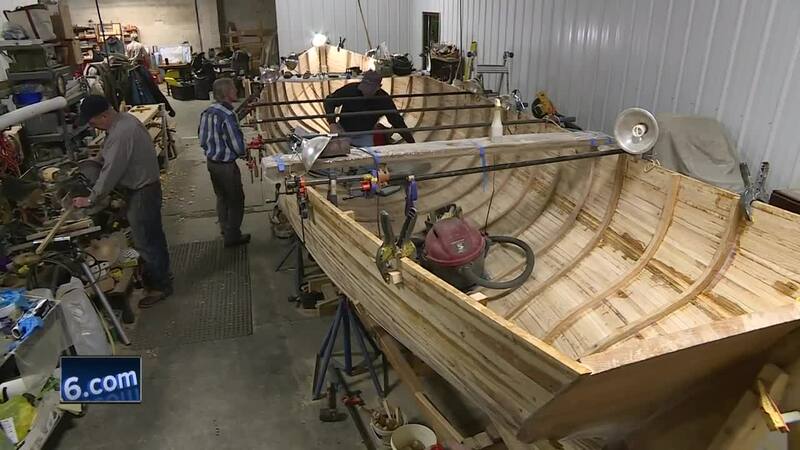 A group of experienced and novice craftsman known as the Hands on Deck program are building boats. Everything from canoes to lobster boats - and for the most part - all by hand. "We go all the way back to the old tradition skills, the old way of doing things," Hands on Deck president Mark Hawkins said. "What that teaches you is patience. You're getting these kids to slow down and then they take that sharp tool and they make that shaving and there's something magic about it." The magic isn't just found in the wood work, it's also in the relationships cultivated by the craftsman. The Hands on Deck program partners at-risk youth with fellow mentors. "It's kids that wouldn't otherwise have opportunities," Hawkins said. "Maybe it's just that they're a foster kid or they're just starting to fall through the cracks." Together, they can create a masterpiece. "I just like working with the mentors," 11-year-old Luke Wesolowski said. "They're all super nice people and they all just help me out. I feel pretty lucky that I get to do this and have the opportunity." "Once they have your trust and they know that you love them and really want to help them succeed, then I have found that there's nothing that they can't do," Hawkins added. As for the end goal with these hand-made boats? "Float," Luke said with a smirk. That part is important too but the real objective is to help these kids see their hard work payoff and come to life. "I think that would be a really cool experience to know you helped build this boat and you're using them," Luke said. "It would be really fun." The Hands On Deck program is one of forty non-profits part of Give Big Green Bay. Once again this year, the Green Bay Packers Foundation and the Greater Green Bay Community Foundation will be hosting the community-wide giving day. The 24-hour online giving event starts at noon on February 20th and runs until noon the next day, February 21st. You can also visit Lambeau Field to donate on computers set up there, or you can visit the Give Big Green Bay website . NBC26 is a proud sponsor this year.